My uncle died last year. He'd been an office clerk all his life, as had my dad, a lovely man who stuck in the same (going nowhere) job for fifty years. When my uncle died (interesting it wasn't when my dad died) I had a moment of clarity, realised we only get one shot at life, and at fifty-seven my shot was probably half way done already (at least). So... my dream has always been to make my living as a creative maker of hand made, useful, beautiful objects. I'd spent thirty plus years mostly as a social care manager sorting out and helping others find/achieve their dreams. My partner and I talked for hours, and I made the break, handed my notice in and left social work last September. It was scary, exciting, made me nervous, and was the best thing I've ever done. It takes faith - in yourself, and in something/someone bigger than yourself to believe you can do it... but what's the worst that can happen - you fail, and try again. 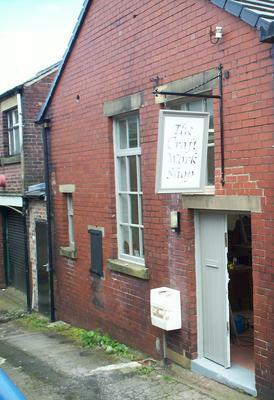 Now I have a workshop and shop in Lindley (in West Yorkshire, UK), selling beautiful things made by local people, recycled vintage furniture, and walls hung with local artists' work - people who wouldn't get space in a gallery... And we have great fun putting on courses in ceramics, painting, jewellery making, felt making and other stuff. By the way my income dropped significantly and continues to be a challenge, but who can put a true value on being content, fulfilled, and, dare I say it, happy? Money isn't everything, and it's certainly not the only thing that makes the world go round. So if you live nearby, come for a coffee and tell us your dreams, we'd love to hear them! Disclaimer: I happen to know Dave a little, as he has a connection with my family - first my Mum worked with him many years ago, and now my sister is working with him in The Craft Workshop he talks of above. Having said that, the few times I've met him I've found a man who's finally committed to living his joy - and part of that joy includes connecting with others, inspiring them (in some small way) to live their joy too. Which is completely in alignment, I'd like to think, to the philosophy behind this Self help Collective site. I'm going to share you on social media . That is my contribution from afar. And being associated with Steve is one of the best resources you have. He is on the top websites list for SBI and this means he knows something about marketing. I think you can do the same and it will propel your business. "By the way my income dropped significantly and continues to be a challenge, but who can put a true value on being content, fulfilled, and, dare I say it, happy? Money isn't everything, and it's certainly not the only thing that makes the world go round..."
I commend your commitment to your goals but I do think making money is not contrary to personal success. From my experience you could benefit from looking at money as representative of energy and a way for people to show they want you to continue to "give" to others through your art. You have an inspirational story and I think, if you haven't , you may want to consider telling it to media outlets online and offline. Your story reminds me of a business I knew about where the woman's story about her journey was just as important as the art and craft of bringing people together.